This year’s regional exhibition, ”Kuroda Seiki: Master of Western-style Paintings of Modern Japan,” was held at The Hiratsuka Museum of Art from July 21 to September 2. A total of 12,746 people visited the museum during this period. The Shonan district where the museum is located was a place familiar to Kuroda Seiki from the time he returned to Japan from his study in France, and he has drawn many works on its ocean scenery. Since the exhibition was held at a place thus related to the artist, this year’s exhibition was well received by the public. 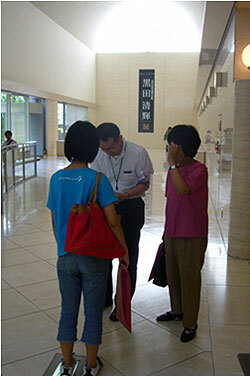 On July 28 questionnaires were passed out to the visitors with the cooperation of the museum. Of the 279 visitors on that day, 161 persons (57 males, 95 females, 9 children; rate of response – 57.7%) responded. Individual comments like “There were many good works on display” and “It was good that we could see this exhibition at Hiratsuka” were given. In addition, the rate of satisfaction with the content of the exhibition in general was close to 100%, visitors choosing either “satisfying” and “rather satisfying.” Exhibition of works by Kuroda has been reopened at the Kuroda Memorial Hall from September 9. During the next year, exhibition is scheduled to be held at the Kobe City Koiso Memorial Museum of Art in Hyogo prefecture. 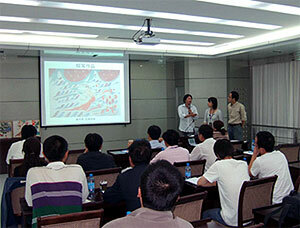 We hope to do our best to make this regional exhibition more substantial than it was this year. Data that can be retrieved from the database on traditional Japanese instruments (accessible from the website of the Department of Intangible Cultural Heritage since May) has been doubled and renewed. The database is based on information obtained through questionnaire survey on traditional Japanese instruments conducted since 2001. In addition to replies from the boards of education of the prefectures and municipalities, responses from museums throughout Japan have been included. Until now the data centered on instruments designated as cultural properties, but with this addition of data from museums, it has become possible to retrieve information about outstanding instruments and unusual instruments held by museums in various parts of Japan. Items and method for retrieval have not changed, but there are more data on instruments like shamisen, koto and tsuzumi., making formation retrieval more interesting. The 2nd Ordinary Session of Intergovernmental Committee on the UNESCO Convention for the Safeguarding of the Intangible Cultural Heritage was held from September 3 to 7 at Plaza Heisei of the Tokyo International Exchange Center. 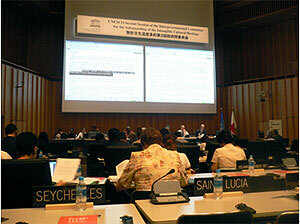 At this meeting discussions were held on the Operational Directives related to the implementation of the Convention for the Safeguarding of the Intangible Cultural Heritage, which was started during the 1st Extraordinary Session of the Intergovernmental Committee held in May at Chengdu, China. Concrete results were obtained on many issues including, for example, the concrete schedule toward the first inscription of the Representative List of the Intangible cultural Heritage of Humanity and the List of Intangible Cultural Heritage in Need of Urgent Safeguarding in 2009. At this meeting, the National Research Institute for Cultural Properties, Tokyo acquired qualification as an official observer, and Inaba from the Japan Center for International Cooperation in Conservation and Miyata from the Department of Intangible Cultural Heritage attended the entire meeting. Consultation with the Agency for Cultural Affairs is necessary whenever someone other than the owners wish to move national treasures and important cultural properties from places where they are kept to other prefectures and to exhibit them. 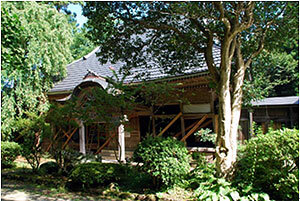 When museums borrow cultural properties for the first time for exhibitions, the National Research Institute for Cultural Properties, Tokyo is commissioned by the Fine Arts Division, Cultural Properties Department of the Agency for Cultural Affairs to inspect the museum environment, including its temperature, humidity and indoor environment, and to submit a report. 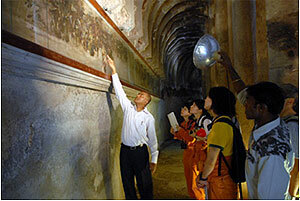 Each year about 20 to 30 environmental inspections are made, but the number is especially large during autumn when many special exhibitions are held. This year, 14 cases of environmental inspections have been conducted at museums in preparation for special exhibitions which are held mainly from September to November, and reports have been submitted. Museum environment thus inspected, materials of cultural properties to be borrowed, duration of the loan and exhibition are examined comprehensively and the suitability of the environment within the museum is judged. Evaluation Seminar, 2007 of the International Course on the Conservation of Japanese Lacquer was held for a week from September 10. This international course on conservation is a joint project with ICCROM, whose headquarter is in Rome. 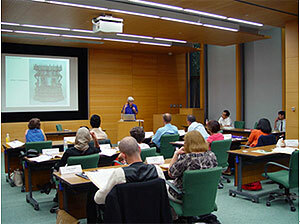 Courses on urushi (Japanese lacquer) and Japanese paper are held in alternating years. Since this year was the fifth year of the course on urushi, the format was changed; instead of the regular course, past participants met to hold an evaluation seminar. On the first two days, 11 participants made presentations concerning how they are utilizing what they learned in the course in their current work while on the last 3 days, the participants went on a study tour to deepen understanding about urushi. 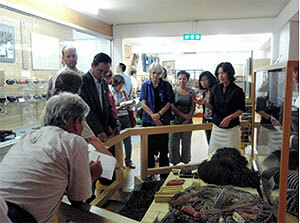 Presentations by participants revealed cases in which the experience and knowledge obtained during the three-weeks’ course in the past are being put to use in the conservation of cultural properties made of urushi in various nations. This and the exchange of diverse information concerning urushi were extremely meaningful not only for the participants but also for us in conducting future courses. Based on the results of investigation conducted in July, Japanese art objects nominated as candidates for restoration during the next fiscal year were investigated at 2 museums in England (Victoria & Albert, Ashmolean Museum) and 1 museum in Germany (Museum fur Ostasiatische Kunst in Cologne ). The present condition of one object at the Victoria & Albert and 3 objects at the Ashmolean Museum were investigated in detail and discussions were held with the museums on problems that may arise in transporting the objects to Japan. We asked that sufficient care be taken when packing those objects that are significantly damaged even now with detached coating film and raden pieces and that have the possibility of becoming more damaged in the process of transport. At Cologne we received the objects to be restored there and handed them to the conservators whom we had dispatched. During this fiscal year an ornamental coffer in the collection of Museum fur Ostasiatische Kunst and a musical instrument (gekkin) from Museum fur Vokerkunde in Vienna are planned to be restored. Indian conservation specialist explains the blackened mural paintings due to darkened shellac varnish. Members of the preliminary mission of the Institute and ASI Ajanta Field Office. 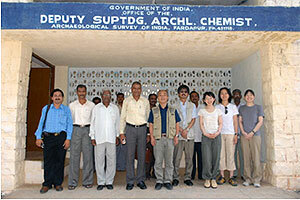 The National Research Institute for Cultural Properties, Tokyo plans to start a cooperative project with the Archaeological Survey of India (ASI) aiming to share and exchange knowledge, expertise and experience on materials and techniques of conservation at Ajanta site. Prior to the project, a preliminary mission was sent to India between 25 September and 3 October 2007 in order to establish a project working plan at Ajanta and to create a common basis with ASI as a counterpart. The Ajanta Caves are located in a great arc cut by the curving course of the Waghora River. Approximately 30 caves were cut in the basalt cliff as Buddhist monasteries and decorated with exclusive paintings and sculptures. Most of the paintings show yellowish tint colour due to past restoration works, thick shellac varnish coatings, by Italian and Indian conservators. Various severe biological causes such as bat excrements and microbiological growth make the paintings invisible. This cooperative project aims to provide information concerning the manufacturing techniques and technologies as well as to challenge the establishment of suitable conservation methods and materials to these particular conservation problems at the Ajanta site. 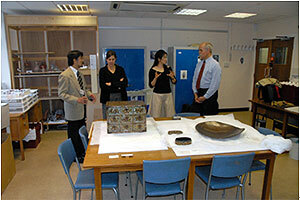 Since 2004, the Japan Center for International Cooperation in Conservation has been conducting a training program for Iraqi experts to rehabilitate the conservation laboratories of the Iraq National Museum (INM). This program is a part of the Cooperation Project for the Conservation of Cultural Heritage in West Asia and the UNESCO/Japanese Funds-in-Trust project, Restoration of the Laboratories of the Iraq National Museum in Baghdad. 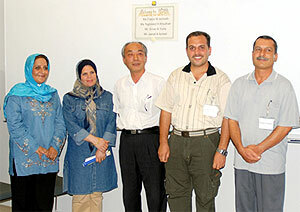 In 2007, the Japan Center for International Cooperation in Conservation has invited four experts between 19 September and 12 December 2007: Ms Faeza M. Jumaah (INM), Ms Taghreed H. Khudhair (INM), Mr Sinan A. Yunis (Nineveh Museum), and Mr Jamal A. A. Ismael (Nasiriyah Museum). 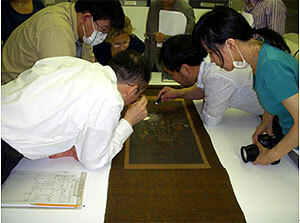 The program focuses on the conservation of wooden objects and is conducted at the National Research Institute for Cultural Properties, Tokyo, the Institute in Nara and Shizuoka Research Institute for Buried Cultural Heritage. As a part of the study on the public system for the protection of cultural heritage, the Japan Center for International Cooperation in Conservation is conducting research on the Central Asia region this year. From 9th to 16th September, a mission was dispatched to Tashkent (Uzbekistan) and Almaty (Kazakhstan) to conduct survey of the current situation of the public system purposing for the protection of cultural heritages in Central Asia and to prepare for the expert meeting on cultural heritage which is planned to be held in Central Asia next March. During the mission, meetings with representatives from local authorities and UNESCO were held in order to collect relevant information and conduct needs assessment. After the collapse of the Soviet Union in 1991, independent Central Asian countries have been facing a wide range of issues, from public system to field work, on conservation of cultural heritage. Through this research, common concerns on cultural heritage preservation within the area have been disclosed, such as conservation and management of archaeological sites, conservation environment of artifacts and human capacity development. Moreover, it was agreed that, under cooperation with those countries, an international workshop with experts from Japan and Central Asian countries would be held in order to share information and to transfer technology. 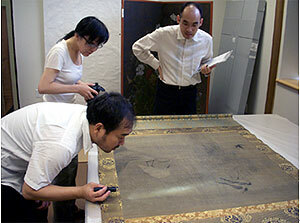 In the 5th phase of the joint research and project between the Dunhuang Academy and the National Research Institute for Cultural Properties, Tokyo, the dispatch of Japanese personnel to Dunhuang to receive training was realized for the first time. The aim of this program is to provide training at the Dunhuang Mogao Grottoes in order to develop personnel who will actively participate in the conservation of mural paintings overseas in response to increasing demands for international cooperation in this field. In the program, which officially started this fiscal year, three graduate students spent 4 months from May 13 receiving training at Dunhuang: Sato Yuki, a doctoral student at the Graduate School of the Tokyo University of the Arts (painting conservation); Fujisawa Akira, also a doctorate student at the same university (conservation science); and Suemori Kaoru, a doctorate student at the Graduate School of the University of Tsukuba (cultural heritage management, art history). For four long months, they stayed at a housing facility at Dunhuang and received comprehensive training related to the conservation of mural paintings including such matters as analytical studies, investigation of the conditions of deterioration, practical work in conservation treatment, reproduction of mural structures and paintings, while making the most of each one’s knowledge in his/her field and filling in where others lacked. The valuable experience at the site is a sign of the success of the training program itself, but at the same time it is hoped that for each of the three trainees the experience will bring great influence on their future studies and work. The three trainees were also able to nurture deep friendship with many of their peer researchers and specialists at the Dunhuang Academy. This training program is scheduled to be held for three more years.